In this podcast, Dr. Craig also gives insight into the whimsical characters of his children's books. Dear Dr. Craig, in several of your debates you mention that people before the time of Jesus or residing in isolated parts of the world could still perceive God’s general revelation of himself in nature and conscience. Would this imply that uncontacted tribes like aboriginal people, etc. simply misunderstood what God revealed to them in nature, taking it to be the work of multiple supernatural beings? Would it similarly imply that they misunderstood the source of human conscience and moral values as something other than God? DR. CRAIG: I would say not necessarily. That could be the case, but not necessarily. I think some people respond appropriately to general revelation and recognize a supreme deity of the world and do recognize his objective moral law. I think, for example, of people like Aristotle or of a person like Job in the Old Testament who was not an Israelite and yet clearly had a relationship with God. So while polytheism and human degradation might be responses by some people (perhaps most people, we would say) to general revelation, it isn't and shouldn't be thought to be universal. Hello, Dr. Craig. I was listening to your Defenders podcast on the inspiration of Scripture where you respond to a scholarly article about how the free will of man and the supervision of Scripture does not allow for confluence to take place. You did a wonderful job of defending the middle knowledge position as a viable alternative. DR. CRAIG: Perhaps we will pause and just explain what that alternative is. What I suggested is that we needn't think of Scripture as dictated by God. Rather, God placed certain persons in certain circumstances in which he knew they would freely write, for example, the letter to the Romans or the Gospel of Luke. Thus, the writing is for us the word of God to us – it is God's word to us – but it isn't dictated by God. It is freely written by the human author. KEVIN HARRIS: “Confluence” is a word that he used. DR. CRAIG: Yes, that is the word that I used to indicate that Scripture is the product of both divine and human activity. My question is this: why assume that if God were to arrest a man's free will in the writing of Scripture through supervision that free will does not exist? It does not logically follow that if God arrests a man's free will in one instance that free will does not exist at all. Nor does it follow that if God can arrest man's free will that he would do so in every circumstance. DR. CRAIG: I think that's correct. But if we can have a theory of the inspiration of Scripture that avoids dictation and avoids God’s having to interrupt at periodic points to make the author write a particular word or sentence that he wanted, that would be, I think, all for the good. So I would just say there's no need for imagining these interruptions in which God arrests the author's free will and in effect dictates what he should write. The issue of mankind not having free will seems to me to have two unwanted consequences. One, it makes God the author of evil; and two, it makes God unjust in creating a creature that does not have the free will to choose its destiny. If God, in a moment in time, arrested a man's free will temporarily in order to pen Scripture, I don't see how this would inevitably lead to either consequence I just mentioned. DR. CRAIG: I agree, and I also agree with those two unpalatable consequences of denying human free will. Certainly, God could interrupt the author's free will to, in effect, dictate something. But if we can have a theory of inspiration that avoids it, it seems to me that's all for the better. Furthermore, I don't see why we would assume that there was a reason that supervision and free will cannot coincide. Just imagine an experiment where you, playing the role of God, ask a student to scribe for you an article you want to write. They would freely choose to cooperate with you as you told them the message that you want to get across. They might even put it in their own words and suggest adding certain things like a greeting or autograph. In this instance there is direct supervision and cooperation and yet confluence. Could it not be the same with the Holy Spirit and the men who penned the Scriptures? DR. CRAIG: What he seems to be suggesting here is that what God would do, like a boss dictating a letter perhaps to a secretary, would be to sort of suggest to the person the general ideas that he wants expressed, what he wants the scribe to say, and then the scribe would formulate it in his own words. It seems to me that that doesn't give us verbal inspiration which is what we want to affirm – the very words of Scripture are inspired, that is to say, God-breathed. So I would say that this theory of supervision falls short of giving you verbal inspiration which is what I wanted to achieve through the middle knowledge perspective on divine inspiration. Thank you for taking the time to read this, Dr. Craig. My question is as follows. In John 17:3, Jesus states, Now this is eternal life – that they know you, the only true God and Jesus Christ whom you have sent. It is important to note that the “you” Christ is referring to in this verse is the Father. This verse makes a distinction between Christ and the Father as two separate persons. Christ makes the claim that the Father is the only true God. How does a Christian reconcile Christ’s claim that the Father is the only true God? Clarification: if the Father is the only true God then to my understanding that would negate the concept of the Trinity because if the Father is indeed the only true God then no one else can be, including the Son and the Holy Spirit. DR. CRAIG: I would say that it's not correct to think that if the Father is the only true God that Jesus Christ and the Holy Spirit are not also the only true God. I have developed a model of the Trinity whereby God is a single spiritual substance (or soul) which is endowed with three sets of rational faculties such that each one is sufficient for personhood. We do have three distinct persons who can address each other as divine, and yet there is only one God – one spiritual substance which is God. I think that makes sense of the data. Biblically, I think it's important to understand that the word God (theos) in the New Testament typically refers to the Father. That's why you don't find New Testament authors saying very often that Jesus is ho theos – God. Instead they took the Old Testament word for God – the Lord (kurios in the Greek) – and applied that term to Jesus and then quoted Old Testament Scriptures about Yahweh with reference to Jesus. For example, Paul says that if you confess with your lips that Jesus is Lord (kurios) and believe in your heart that God raised him from the dead, you will be saved, for everyone who calls upon the name of the Lord will be saved (quoting there an Old Testament passage about Yahweh and applying it to Jesus). So the New Testament authors would refer to the Father typically as God and would refer to Jesus as Lord which is the Old Testament name for God. They tried in every way they could to express the full deity of Christ while at the same time not saying that Jesus is the Father. KEVIN HARRIS: When Jehovah's Witnesses get that – what you just said – they run from the Watchtower as fast as they can. It's so important. Next question. I have been listening to your podcast, Defenders, and my question deals with something that was never fleshed out during the analysis of the ontological argument. If God exists in all possible worlds, and possible worlds must exist for myself to have free will, then doesn't this mean that all possible worlds must exist as much as this reality does? Doesn’t this mean there exists a reality where I am a murderer or unbeliever? Since God must exist in all possible worlds, these possible worlds must exist the same as our reality does. The idea of multiple versions of myself doesn't sit well with me. Thank you. DR. CRAIG: Well, I certainly agree with Matthew that we ought not to affirm multiple versions of ourselves! But to speak of possible worlds is not to posit a sort of multiverse theory in which you or counterparts of you exist in various universes. Rather, the language of possible worlds is just a heuristic device for talking in a picturesque way about possibility and necessity. We shouldn't be confused by existential language about possible worlds. When we say “a possible world exists,” we just mean “it's possible that . . . .” That's all it means. It doesn't mean there exists some thing – some possible world. If I say, “In some possible world, Kevin is wearing a red shirt,” all that means is that if that world were actual then Kevin would be wearing a red shirt. It doesn't mean that there is some reality in which you have a red shirt on. KEVIN HARRIS: It's a possible world. DR. CRAIG: Yes, and it doesn't exist in any sense. The only world that exists is this one. But if that other possibility were actual then you would be wearing a red shirt. So he's been confused here by this existential language of existing in possible worlds and failing to understand that this just means that if this were actual then this is the way reality would be. 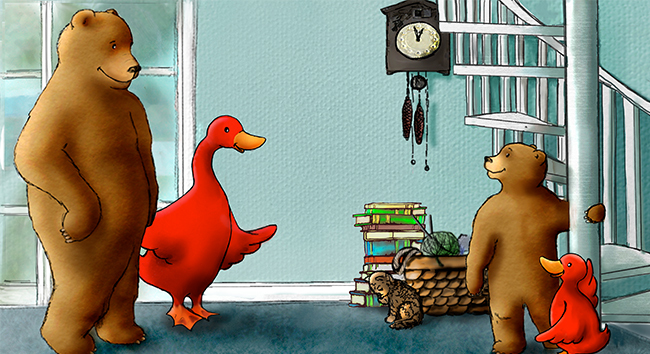 I love Dr. William Lane Craig’s children's books, but why do they feature an interspecies marriage between a bear and a goose? I love the books other than this feature. DR. CRAIG: She's referring to our children's series, What Is God Like? which features these lovable drawings by Marli Renee of the family of Brown Bear and Red Goose with their children Charity and John. I have found that the only people who have problems with this are adults who seem to lack imagination and fantasy. KEVIN HARRIS: This isn't the only time this has come up? DR. CRAIG: Oh, no! No, I get this from adults. They're troubled by it – how can a bear and goose be married to each other? KEVIN HARRIS: I never thought of that! DR. CRAIG: It's amazing how persnickety adults can be. Children don't have any problem with make-believe or pretending. But I've had people say, Is this implying some kind of transgenderism or homosexual marriage or something? I said, Come on! Papa Bear is a papa bear, and Mama Goose is a mother goose. They’re clearly gendered, but adults sometimes lack the ability to make believe. But the reason behind this is very easy to explain. This is Jan and me and our children! When Jan and I got married, one day as an elementary school teacher she quoted to me this little saying, “Brown bear, brown bear, what do you see? I see a red goose looking at me.” And I thought it was so charming that I began to draw pictures for her of Brown Bear and Red Goose. So for the last forty five years or so, every anniversary, every birthday, every Christmas, every engagement anniversary, I draw for Jan a bear and goose picture in which the bear and goose are doing things together in our lives that are better than a photograph album in terms of evoking those memories of us together. And the two little children are our children. So it's purely personal. We so love these characters we wanted to share them with others. I originally wrote these books for our own children. This was my way of teaching them about the attributes of God. But in the end, Jan said, Let's share these with others, and so we found this young artist Marli who could draw the bear and the goose and the gosling and cub in the way that I had and could imitate my style. The result was this series of charming booklets. KEVIN HARRIS: I’m glad we got that straight! DR. CRAIG: [laughter] Me, too!